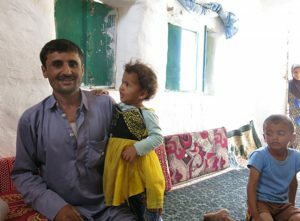 During the field assessment for kids and women who suffer from malnutrition in Al- Ghayl district of Al Jawf governorate, ADRA team met with Sena Khalfan’s family and his four children in their home and were introduced to their story. The father, Mane, have been struggling to provide critical food for the family, his younger daughter, Sena, was especially affected when hunger and inconsistent diet caused her weakness and severe malnutrition. Soon she couldn’t walk anymore and Mane felt helpless. ADRA team checked on Sena and provide MUAC screening. Mane was informed by the team that her condition require an urgent medical attention and that he should refer her to the nearest hospital. But due to in on-going conflict, most health facilities in the governorate were closed. The accessibility for many families to nutrition assistance was extremely limited. ADRA through project ENSAF, introduced a mixture of domestic natural grains to the rural communities in Al Jawf and Marib that could improve the condition of malnourished children when there is no medical attention available. The project team provided the mixture to Mane and instructed him on how to cook it and use it. He used the supplement immediately and later visited the project’s office in Al-Hazm to receive more. As he gladly noticed a visible difference in Sena’s health and well-being, and was gradually regaining her strength. The team visited the family once more during the Hygiene Kit distribution, and Sena’s father welcomed them with generosity; expressing gratitude to ADRA and the team for providing his daughter with the much needed life-saving assistance. When the team asked to see Sena, the father laughed and pointed at the healthy girl sitting on his lap.